U-266 and Ramos 96 h proteome samples labeled with Cy3 and Cy5 dyes, respectively, and separated in nonlinear pH gradient 3-10. Internal standard (Stnd) is pooled reference sample labeled with Cy2 and run on the same gel. Move the mouse pointer over a spot to see the protein name and number referring to Table 1 and Supplementary Tables 2-3. Click on the spot to get UniProt information about the protein. Double image overlay enable easy visual comparison between Ramos 96 h (Cy5 green) and U-266 (Cy3 red). Green proteins are unique to Ramos whereas red proteins are unique to U-266. Red/green indicates that protein abundance is higher/lower in plasma cell compared to immature B cell. Yellow proteins are shared between Ramos and U-266 (no difference in protein abundance). Triple image overlay enable comparison between U-266 (Cy3 red) and Ramos 96 h (Cy5 green) in relative to Stnd (Cy2 blue). Red and green proteins are highly expressed in U-266 and Ramos, respectively. Blue proteins are negligibly expressed in U-266 and Ramos relative to Stnd. White proteins are shared between the three samples (no difference). 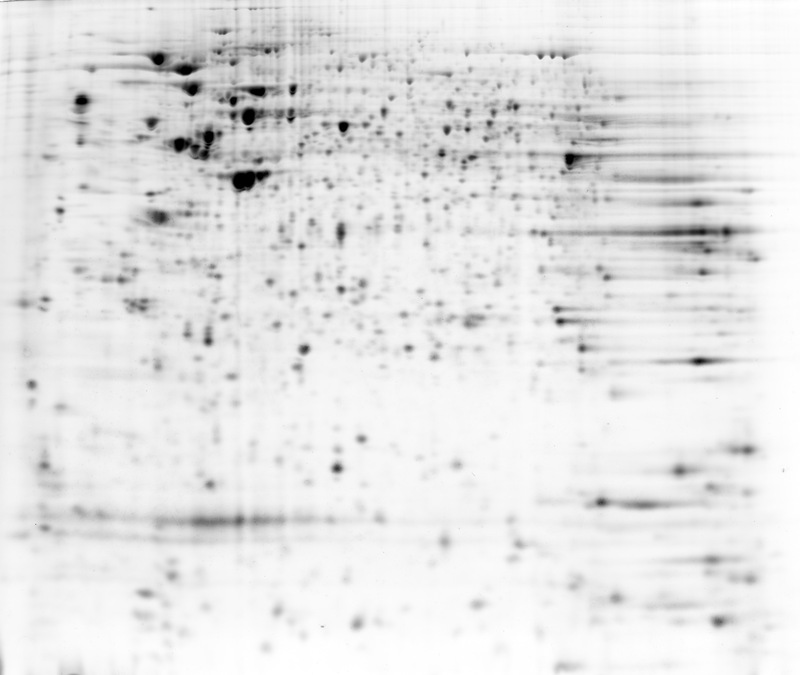 Yellow proteins are highly expressed in Ramos and U-266 relative to Stnd. Turquoise and purple proteins are negligibly expressed in U-266 and Ramos, respectively.